When it comes to bed-sheet thread counts, more doesn't mean better. While luxury sheets range up to a 1,200 thread count, a 400 count is the ideal number. According to Consumer Reports textile expert Pat Slaven, fabric looms cannot accommodate more than 400 threads, so thinner threads twisted together are used to achieve higher counts. Rather than using thread count as a buying guide, focus on the type of textile and weave to determine the best bed sheets for you. A close-up of two beds with sheets and pillows. 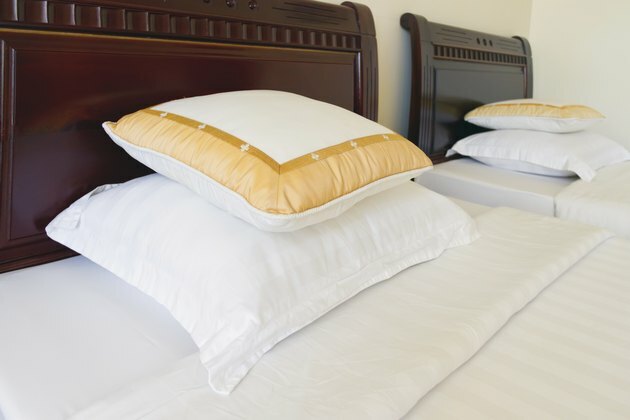 Sheet are made from a variety of materials, including silk and satin -- however, cotton is considered the top textile for sheets thanks to its breathability. Of all the cottons available, Consumer Reports recommends combed, Egyptian and Pima cotton for their strength, softness and durability. Supima cotton, a superior grade of Pima cotton, also falls within this recommendation. Search for materials that are 100 percent cotton, rather than cotton blends. Terms such as percale and sateen refer to the type of weave used to produce the materials. Opt for sateen weave for a softer feel, or percale for crisper sheets.